Sacred Tree (Sthala Vriksham) : Vilwa Tree. This is the 07th sthalam on the southern side of river Cauvery. Appar (Thirunavukkarasu Swamigal) has sung hymns in praise of Lord Shiva of this temple. Thiruverumbur is a village located near Trichy city in Tamil Nadu state of South India. It has an important Hindu temple dedicated to Lord Shiva. 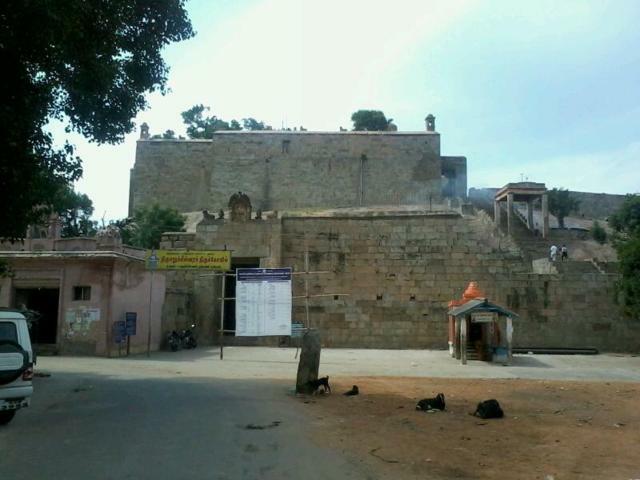 This temple is considered as the seventh among the Tevara Paadal Petra Stalams (274 most important temples of Lord Shiva) located in Chola country south of Kaveri river. Appar has revered the temple in his verses in Tevaram. Manickavasagar has revered the Lord in Thiruvasakam. Ramalinga Swamigal has also revered the temple in Thiruvarutpa. 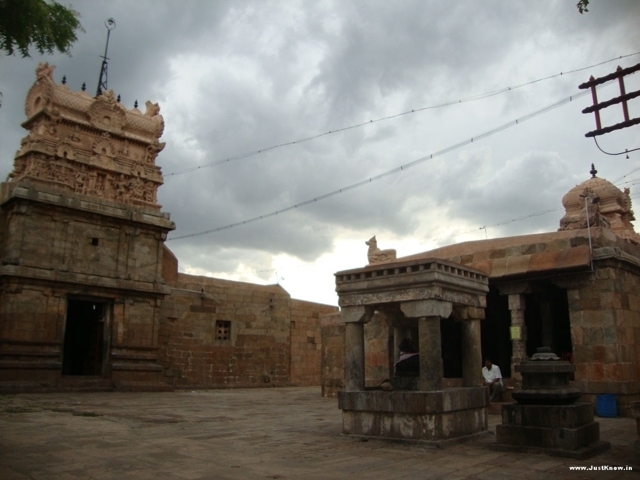 The current form of the temple was built by Aditya Chola in the 9th century CE. 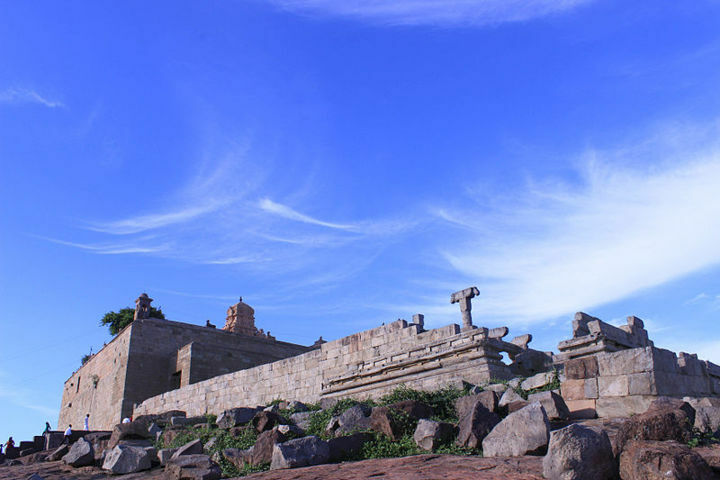 To commemorate his victory in Tirupurambiyam battle, he built a series of temples including this along the banks of the river Kaveri. The temple has a lot of inscriptions of Chola period. It is a declared monument of the Archaeological Survey of India. It acted as an infantry for the French troop when they were fighting with the British in 1752 CE. The main deity is in the form of ant hill (mud mound). 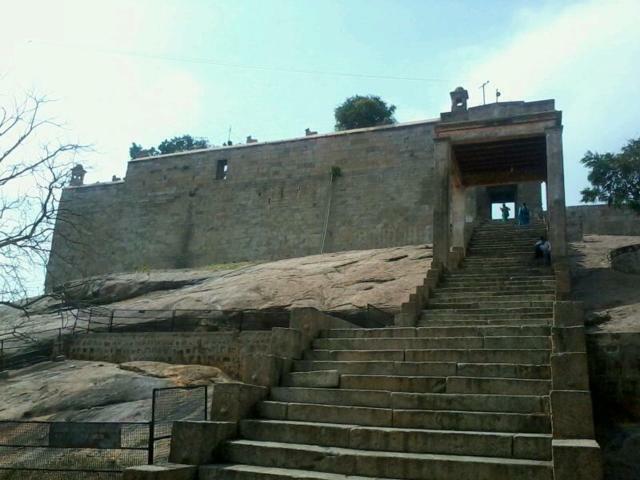 A 100 steps to be climbed from the base to main entrance hill sannadhi. As per the legend, the demon named Tarukasura defeated the Devas. As per the advice from Lord Brahma, the Devas along with their leader Indira came to this site to worship the Lord. In order to escape from the attack of the demons, they took the form of ants and came over here. As the surface of Shiv Linga was slippery, the ants could not climb. Hence, the Lord took the form of ant hill and also slightly slanted his head to enable the ants to climb. Erumbu means ant in Tamil language; the Lord is thus called as Erumbeeswarar. Erumbeeswarar temple is located atop the hill at a height of around 60 feet which can be reached by a fleet of steep steps. As the temple is located on top of the hill, it is also called as 'Malai Kovil' (malai=hill). The temple has a small two tiered tower. 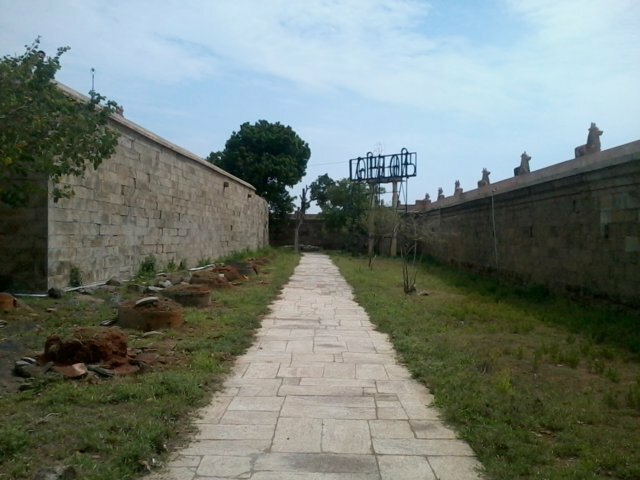 As usual, the flag post, bali peeth and Nandi mandapa are found. The main shrine has the idol of Lord Shiva in the form of ant hill with its head slightly slanting on its left side. The Lord is named as Erumbeeswarar temple. The marks made by ants can still be seen in this idol. The Goddess Narunkuzhal Nayaki bearing a very beautiful Tamil name is found in a separate shrine outside the main shrine. 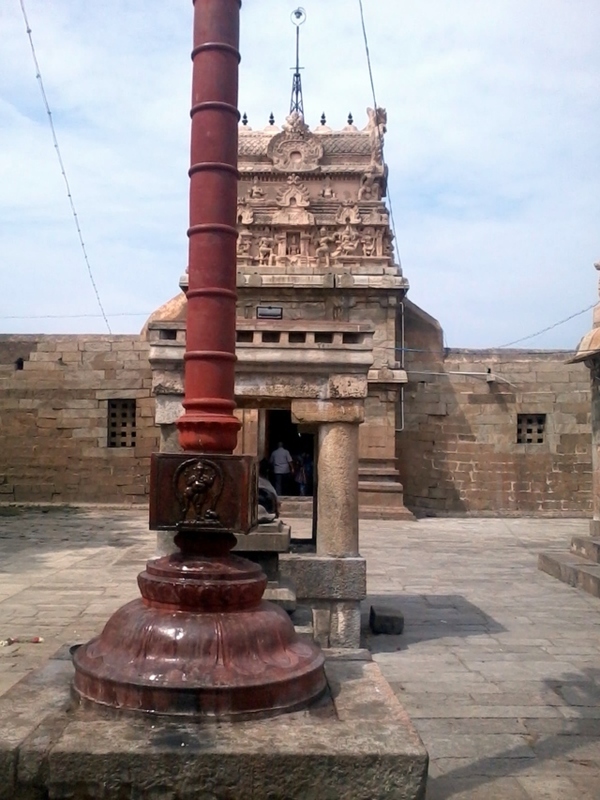 The temple has two prakaras. 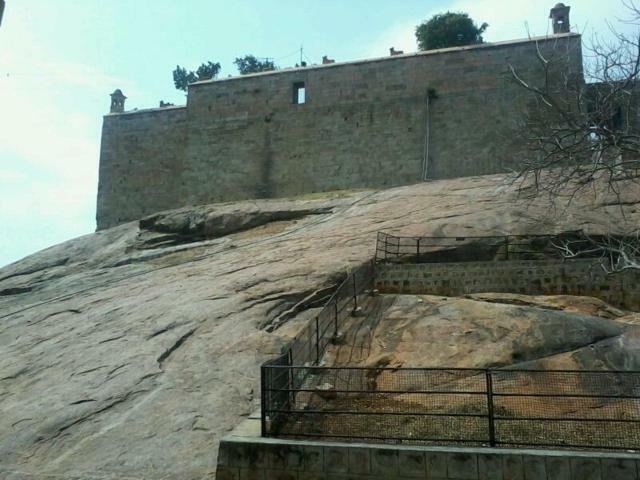 The entire complex is surrounded by thick fortress walls. 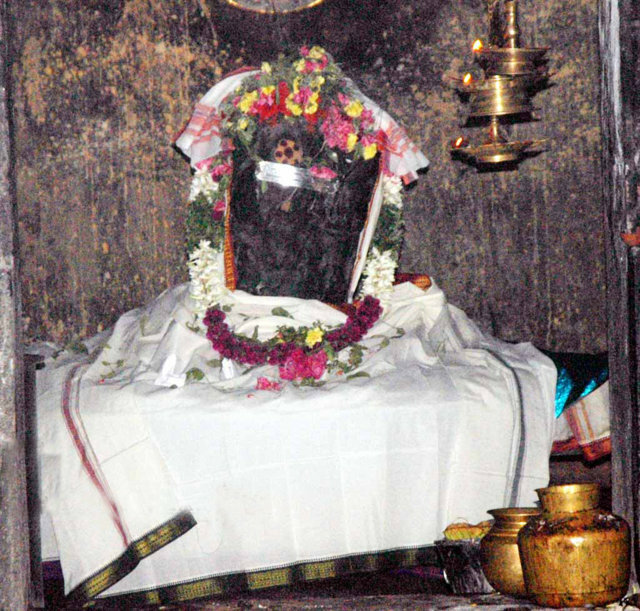 The first prakara has the idols of Ganesha, Bana Linga, Kailasanathar Linga, Bhairava and Kasi Vishwanatha Linga. The small shrines such as Ganesha, Subramanya with his consorts, Nataraja-Sivakami, Navagraha and Gaja Lakshmi are also found in this temple. The idols of Ganesha, Dakshinamurthy, Shankara Narayana, Brahma, Durga and Chandikeshwara are found as Koshta idols in the wall surrounding the main shrine. The images of Shankara Narayana and Brahma are artistically beautiful. There is a shrine for a slightly bigger idol of Ganesha at the foothill. 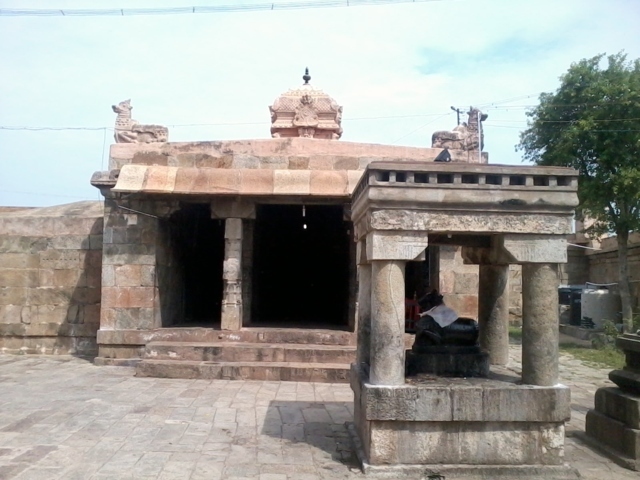 The holy tank is also found opposite to the temple entrance. 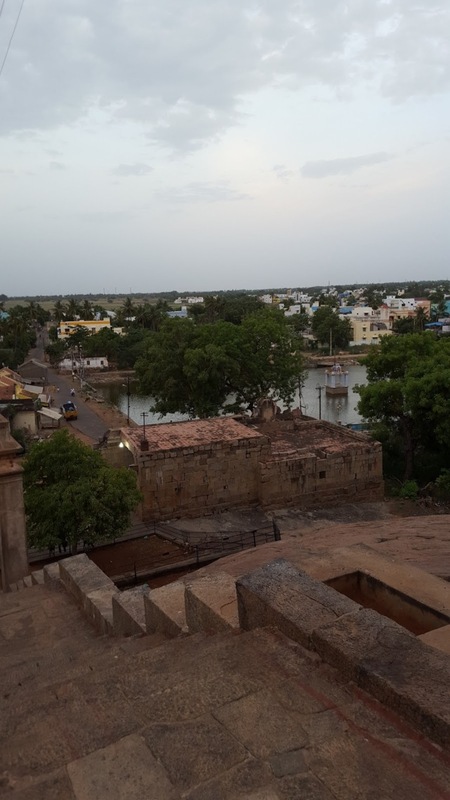 On top of the hill, one can get an aerial view of the entire village, the river Cauvery and the holy tank. A historically important site with artistically beautiful idols - don't miss! Sun God in the Navagraha shrine is with His two consorts Usha and Pradyusha both facing each other. Lord Kailasanatha graces from a separate temple left of this temple. The temple has four theerthas – Brahmma Theertham, Madhu Theertham, Kumara Theertham and Padma theertham. 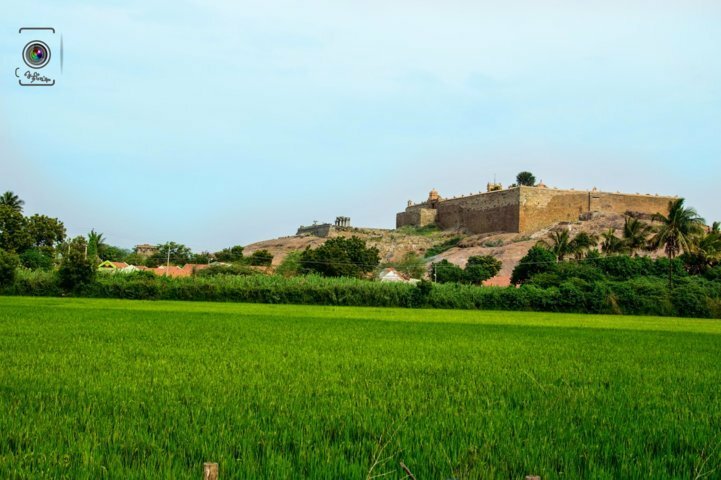 It is said that the hill of this place is but a piece of the Meru mount split by Vayu – God of Wind when a competition arose between him and the divine serpent Adisesha to decide the power of their physical strength. 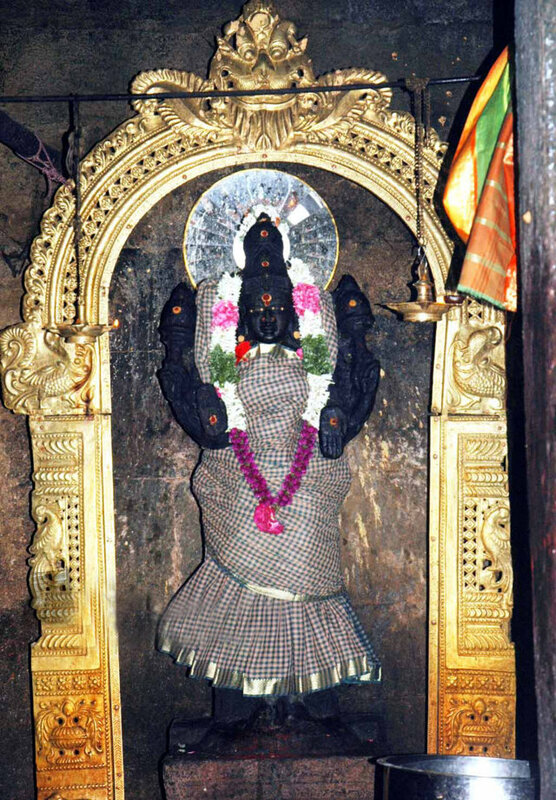 There is Lord Shanmugha Subramnaya’s shrine with His consorts Valli and Deivanai between the 2 Kasiviswanatha shrines behind the sanctum sanctorum. There is the Shatkona Chakra below His Peeta. Worshiping Lord Shanmughasubramanya along with this Chakra brings immense benefits to the devotee, it is said. Selva Vinayaka graces the devotees in the temple. Shiva Linga in the sanctum sanctorum is in an ant-hill shape with ups and downs without a perfect shape. It is a sand Linga, hence no abishek is performed. Only oil application is followed. As there is a gap in between, it appears as if there are two Lingas. It is said that the right side is of Shiva part and the left as Shakti part, hence praised as ‘Shivasakthi Linga’. As ants (Erumbu in Tamil) are consuming the nivedhana objects in the sanctum, it is believed that Lord Shiva Himself is acknowledging the nivedhana offers during the Pujas. This darshan is considered very important by the devotees. It is also believed that Rathi, wife of Manmatha-Cupid worshiped the Lord praying that her alluring beauty should not make her proud. Swarnakala Bhairava shrine is in the prakara-corridor with a furious look. Mother Gajalakshmi is opposite to Bhairava in a separate shrine. Worshiping both simultaneously relieves the devotee from fears and ensures prosperity in family. Mother Narunkuzhal Nayaki – Mother with a fragrant hair – graces from a shrine facing south. Different Alankaras are followed for the mother each day. Just before Mother Narunkuzhal Nayaki there is an idol of a Mother worshiped in olden days. Of the two dwarapalakas in the Lord’s shrine, one looks angry, the other smiling. People generally known for their temperate qualities, become softer after worshiping the Lord, it is believed. The one special feature in the temple is Lord Sankara Narayana combining the greatness of both Lord Shiva and Lord Vishnu and Lord Nataraja with anklets behind the presiding Lord Shiva goshta wall. Devas, an elite community in the celestial world lost all their wealth and position to demon Tharakasura. They approached Lord Brahmma for remedy. He advised them to worship Lord Shiva in this place with flowers and assured them that the demon would be killed by Him. To escape the attention of the demon, Devas took the form of ants (Erumbu in Tamil) to worship Shiva. As the Linga was too soft and slippery and steep, they could not reach the top of the Linga. All merciful Lord, changed His form as an ant-hill also leaning slightly to facilitate their pujas to Him. Lord came to their rescue, destroyed the demon. He is praised as Erumbeeswarar. accepted the pujas offered to Him. Prayer to Lord relieves the devotee from laziness and turns him/her active. Hardships in life will vanish. Devotees offer vastra and sweet pudding-sarkarai pongal as nivedhana. Location: This temple is located 11 Kms east of Trichy by road. Tiruverumbur railway station is on the Trichy - Thanjavur section of the Southern Railway.